Rhodeygirl Tests is having a Cookie Contest!!! Submit your recipe by this Friday, December 5th. She's going to pick 6 finalists and make each of them over the following 10 days to decide on a winner! Heather and Mark at HangryPants have announced their quest for the month of December, to help raise awareness and money for those less fortunate. Every comment made on the blog until December 22nd will earn 5 cents and will be donated to the Rhode Island Community Food Bank, along with all financed with their earnings from Food Buzz! What a fabulous idea...those two are so clever! Katie over at Good Things Catered started 25 Days of Treats yesterday. Each day until December 25th she will be sharing a recipe for a treat that is easy to make, package and ship to be used as gifts this holiday season! She's already got a couple of good ones posted...go check them out! BSI: Ginger!!! Don't forget to submit your recipe to me by 8pm this Sunday, December 7th. 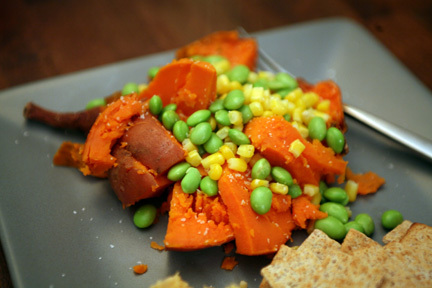 Dinner: Baked sweet potato with 1/3 cup edamame and 1/3 cup corn, sprinkled with sea salt. 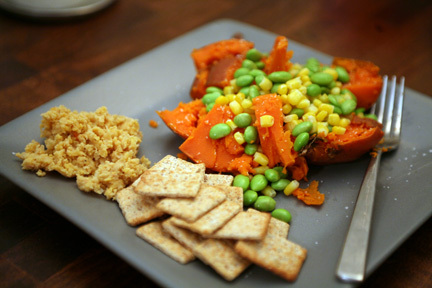 Some mashed chickpeas and Kashi crackers on the side. I was in the mood for something simple and satisfying...this did the trick! Alright, sorry this was short and sweet. I'm thinking of trying one food diary post a day, what do you think? Its a little stressful trying to get a post up in the mornings before work or during my lunch break, and I was thinking it might be better to consolidate all the day's eats into one posting. Any thoughts? Suggestions? Does it even matter? :) What is your favorite time of day to catch up on your blog reading?